So why aren't I? I'm stuck in university land where there is still school.... Unfortunately my school went on strike for three months, thus forcing the students to pursue schooling into the summer months.. lets not talk about the repercussions! So I'm finished school tomorrow... finally! I'll have more time to go out on the water! Yesterday and today the Bass are biting top water! Yesterday in four casts I caught three fish! Man, Do I Hate SPAMmers! Hey all - just wanted to give you a heads-up on a new member who has probably already sent you a message about making money using GetReeled as a platform. Just signed up, no posts and feels compelled to try and sell me his "free" product...I sent him a message and blocked him from sending me further messages....Can't stand that stuff. Here is his page if you would like to do the same. RapalaNation.com Charity Raffle for C.A.S.T. for Kids! Starting June 1st to June 30th, we will be selling raffle 'ticket's on RapalaNation.com to benefit C.A.S.T. For Kids! CAST For Kids is a great charity that helps disabled or under priveleged kids get a day out in the outdoors to expose them to this wonderful sport we all love so much. We are offering up a total of five prizes. I do most of my fishing on the kansas side,Hillsdale,Wyandotte county lake, perry lake, Pomona Lake, Levenworth county lake, Perry lake. I have not got started up strong yet. April 15, caught a few small crappies and a couple 2 or 3 lbs. channels. would like know if anyone else has any stories. on east kansas lakes? Hi. If you want to go into a fun, low key fishing derby, try entering the 2009 CFPS Chantry Chinook Classic Fishing Derby that is centred around Port Elgin, Southampton, Pike's Bay and Kincardine on the Canadian side of Lake Huron. It is the 26th annual derby and runs from July 25 to August 8, 2009. Entry fee is $25.00 per person and $55.00 per family, I think. Check out their web site by Googling - Chantry Chinook Classic Fishing Derby - for more information. the fish are biting, catching bass, pickerel and perch. Greg Loper and Ken Loper take the $10,000 purse at BIG WALLY'S SPRING WALLEYE CLASSIC with a total weight of 30.54 pounds. I stumbled across this article in the latest issue In-Fisherman and figured I'd pass it along! Having hard time finding these bugers with the water so high anyone have any help for me?? If you are a big fan of fishing or maybe even collecting Rapala lures, then I invite you all to come on over and pay RapalaNation.com a visit! 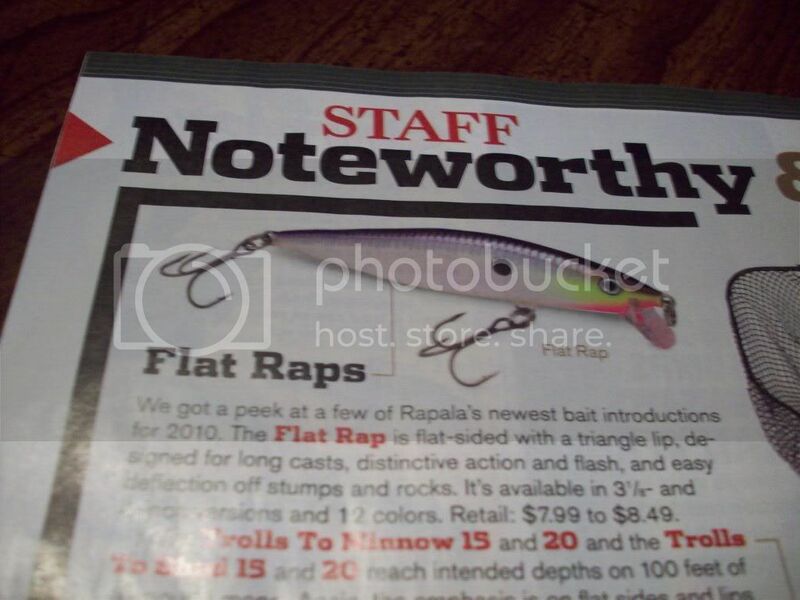 About five years or so ago, I began to think to myself, "We all know Rapala lures catch fish - but what if the fish have 'gotten wise' to Rapala lures, and have maybe even gotten a little gun-shy?" hope everyone has a great week, and if you get a chance to wet a line, good luck with that too. GOD bless you all and take a kid fishin!!!!!! This Is A Fishing Blog, Right? Just inviting anyone who would like to drop by and check out my latest blog post. Some "sad" fishing and looking to help out another outdoor blogger who fishes. Read here! Long Lake : A sucess ! The temp. is 100, the pool is open and the beer is cold. Gee, it must be summer already.